During finals week of last semester, I set my mind on joining ROTC. However, it being the last week of school, and with my spring schedule basically already set, I wasn’t sure if it would work out according to plan. Luckily, after several advisor meetings, plus a little bit of switching my schedule around here and there during the first week back after winter break, we made it happen. I was extremely excited to finally get the chance to experience something I have always wanted to do, yet, becoming a part of ROTC was also quite intimidating because the majority of the students in my class were, and still are, a whole semester ahead, since I started in spring—as opposed to fall—semester. Additionally, aside from a summer camp that integrated physical training into its program, I have no previous knowledge of anything military, which made me feel all the more behind. However, someone outside must be looking out for me, because it just so happens that one of my initiation class Alpha Delta Pi sisters also joined ROTC this month. I have also met a few other girls, all of whom have been friendly and supportive, guiding and helping me get to know the ins and outs of ROTC. I am glad to report that I survived my first full week of ROTC, which included three mornings of physical training and an hour long lab class. Waking up at 6am everyday will soon become a norm, which, as a morning person, I am honestly pretty happy about. Even though I am still in the process of getting into the swing of things, I am eagerly looking forward to the upcoming weeks of ROTC. Taking part in this distinctive program gives me a sense of greater purpose and will train me to be mentally and physically ready for basically anything that life throws my way. I never saw Damen Student Center more crowded than today. I was standing on the second floor, looking over the glass balcony, and at least two hundred students scurried around on the main floor. They all turned to watch the big screen as the music blasted on and the lights dimmed. DOP readied the balloons to fall, and the countdown began. DOP was revealing the Colossus artists for 2015. When Gabriel Iglesias and Jason Derulo were revealed, applause and balloons filled the air. Earlier in the day, the crowd at Damen was upstairs at the Organization Fair, milling around table after table with representatives from several clubs. I stood at the table for National Society of Collegiate Scholars, across from the Pre-Vet Club and the Psychology Club. Everyone filed through, looking for a new club to add to their list, scribbling their names down on membership lists. Once everyone cleared out from the Organization Fair, the Wellness Advocates took over the multipurpose room and set up tables, posters, and a buffet of cookies and milk for their Sleep Workshop. After buying Colossus tickets and hoarding as many club flyers as possible, students migrated upstairs to learn about the importance of sleep during the college years. Wellness Advocates gave away free samples of Aveda aromatherapy, Neuro beverages, and calming music. In one day Damen alone housed three major events, and each were impressively well-attended. I love going to a school where such a variety of events are just around the corner from each other. AMSA (American Medical Student Association) is one of two groups I am part of, here at Loyola. It is a wonderful group that prepares you for the medical career by familiarizing you with MCAT prepping, listening and meeting guest speakers, and participating in things outside of the school (like volunteering at a school or city event). I have been a part of AMSA since the beginning of school and have enjoyed being a member. As you might know from my other blog posts, I aspire to become a doctor and being in AMSA is a perfect fit with other members who have the same/similar aspiration. Truthfully, I have not attended many meetings last semester, but I hope to attend more meetings more consistently because my longest day (classes on campus) fall under the same day AMSA has their meetings. AMSA is beneficial. It helps prepare us for the healthcare profession. From a range of guest speakers, we listen and understand their medical journey and experiences and consider their advice. My favorite guest speaker would be Dr. Vitale who brought tons of laughter into the auditorium through his experiences and motivated us to pursue our ultimate passion and put aside the challenges and hardships that comes along with the passion. I highly recommend any pre-med students to become a part of AMSA. You will gain a substantially greater knowledge in the medical field and will help prepare you to make wiser decisions in the future. Hi there! Today I wanted to share with you a resource on campus that I’ve found so useful in the last couple of months and this is the Career Center! The Career Center is probably one of the most useful resources you could find on campus! This is the one stop destination to help you figure out what you want to study, where you want to work, how to create the perfect resume and even how to successfully interview for a job! For all of you out there, who have never ventured to a career center, and may think that this place has nothing to offer you, I recommend that you take a trip to this wonderful place 🙂 I promise you will leave with a few tips and tricks that will make you a successful student and job applicant! If you love cheesecake and live in the city of Chicago, then you must know about the greatness that is The Cheesecake Factory! In this post, I will be talking about how wonderful of a place The Cheesecake Factory is for cheesecake lovers like me! Since moving into the city in August, I have been to The Cheesecake Factory about three times. Twice I have just ordered cheesecake to go, and once we actually sat down in the restaurant for dinner and dessert. Both experiences were excellent! The Cheesecake Factory offers a wide variety of cheesecake flavors, both traditional and some original! I have tried only two cheesecake flavors so far: the Godiva Chocolate and the key lime cheesecake. They were both so different but so delicious in their own distinct way. I am dying to try more flavors, and look forward to doing so within the next few years of living in the city! Not only is the restaurant food and dessert amazing, but so is the atmosphere. The interior of the restaurant is very dim and has a mellow aura. The ceiling and posts almost resemble giant mushrooms, making one feel like they have been transported into a fantasy world. This atmosphere makes the visitors more comfortable, ensuring that they will enjoy their meal and have a visit they are sure to remember! The Cheesecake Factory is located below the Hancock Center on Michigan Avenue, right next to the Water Tower Place. There is usually always a small wait, so it is recommended that you keep that in mind and plan to do something else while you wait for your table to be ready. It is also a little bit pricey, but when they have food and cheesecake that good, waiting and paying more is definitely worth it. If you have never tried it before, this is one restaurant I’d recommend visiting before your stay in Chicago is over! We already know that we are super awesome, but how exciting is it that we made the 2015 Guinness World Records? Have you heard of it? 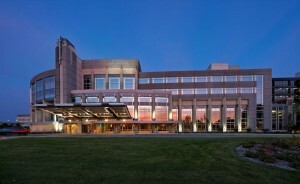 If not, let me tell you that Loyola University Medical Center holds record for care of world’s smallest baby! According to some sources, Loyola has maintained its record for over 20 years (sine 1989)! In 2004, a baby weighted 9.2 ounces and survived; this is what got is in the Guinness World Records. Do you want to know Loyola’s premature babies survival rate? An astounding 98%! These are great news considering the critical care that these babies need. Loyola obtains some of the most advanced technology required for sick and premature infants. The Loyola Phoenix quoted that: “The doctors, nurses and respiratory therapists are all taking care of babies. One reason Loyola has been successful is because of everybody working together.” Working on a Nursing/Rehabilitation home, I have to agree that teamwork is the main ingredient to make anything work, especially in this type of setting. It does not come to any surprise that Dr. Jonathan K. Muraskas, head of the NICU, acknowledges this. If you did not have enough things to brag about Loyola already, here is another one! Honestly, it is a blessing to me that I am a part of this community. Achievements like these make me appreciate my education at Loyola University Chicago so much! When I thought of what I’d be doing on campus while I was studying abroad at the John Felice Rome Center I figured it wouldn’t be much besides studying, eating, and sleeping. I’ve already been proved wrong. The Student Life team at the JFRC has given us the opportunity to be more than involved during our time on campus. Calcio–Probably everyone’s favorite JFRC activity is the campus calcio (soccer) league. For 40 Euros everyone is assigned to a team, given a t-shirt, and on Wednesday nights will take the field for a game. Games start next week and I can’t wait to be a part of this JFRC tradition. 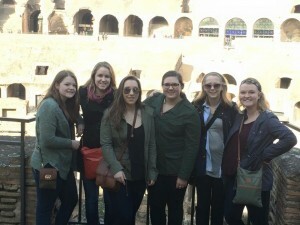 Student Activities Committee–Another great way to be involved on this campus is in SAC. This group is similar to what ((dop)) is at LUC. Throughout the course of the semester we will be planning events including: karaoke night, a student forum, a talent show, and the end of semester banquet. Christian Life Communities–CLC’s will meet on a weekly basis and give students the opportunity to share with each other how we are doing mentally, emotionally, and spiritually. Each group will be a led by a student here and will allow students another chance to build community. Tutoring and Babysitting–Students also have the opportunity to get to know an Italian family in our neighborhood by working as a tutor or babysitter. Tutors will assist in teaching English to kids. Let me begin my saying that I have never talked so much, to so many people, in my entire life, as I have this weekend. Since last fall, going through Panhellenic sorority recruitment was something that I had looked forward to with eager anticipation. However, no one warned me of what was to come, which some have said is comparable to speed dating, for three straight days, essentially non-stop. After 22 hours of meeting and chatting my way through all the members of different sororities, I now have nearly two hundred friends, whom I call sisters. Through this process, I found a home away from home, and I am extremely grateful to be part of such a wonderful family. Nevertheless, the path to here comprised somewhat of an arduous and exhausting, yet rewarding and exciting journey. 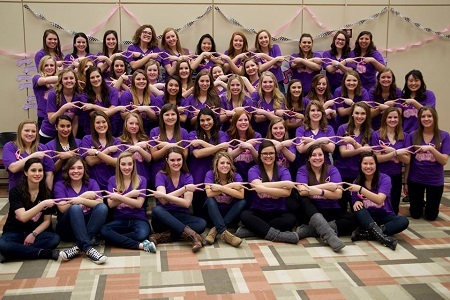 This year was the first time that recruitment was held in just one weekend during the spring semester. On the first day, Friday, potential members, me among them, visited the six different PanHellenic sororities on campus, staying for 20 minutes at each. The following day, we recruits visited at most four sororities for 30 minutes each. Then, on Sunday, the final day, we spent 40 minutes at each sorority. Making a decision that will impact the next years of college life and beyond that, based on 90 minutes of interaction, really places a huge amount of importance on first impressions. This experience has allowed me to meet many fellow Loyolans with whom I would not have otherwise crossed paths and has enlightened me in several ways. Of course, not everyone who goes through recruitment will end up “loving” Greek life, and that is okay. I think the most important thing is giving it a try, so that you will not have to wonder ‘what if,’ the most haunting question of all time. If you have even the slightest possible interest in an activity, try it out, because you never know what the outcome may be. In addition to broadening your social, academic, or career network, you might be surprised to discover a latent interest or talent, and the experience itself is likely to leave you with insights that you can draw upon down the road. I have to admit that choosing a ‘sisterhood’ was probably the most difficult decision that I have ever had to make in my life. Yes, it was even harder than choosing a college, because the only deciding factor was “how I felt,” in other words, my impression of the sorority. It took me two long and grueling hours of going back and forth, to decide between my top two choices. I was uncertain until the very last second. In the end, I went with my gut and chose the sorority with which I had always felt an affinity. Today, having rebooted back into the calm of my daily routine after a turbo-charged Greek weekend, I can safely say that I made the right decision. Hi there! I’m back to tell you a little bit more about all the cool opportunities that Loyola has to offer! This time, though, I want to focus about the cool things you can do on campus! Every year, an event called the Organization Fair happens on campus, where EVERY SINGLE organization on campus comes together and gives you an opportunity to find the things that interest you most! It’s one of the best ways to get involved! While we are already in January, some of you may be thinking that halfway through the year is a weird time to get involved with things on campus… but I’m here to tell you other wise! It’s never too late! Getting involved with the clubs and organizations that are your passions, interests, and hobbies is one reason why college is the best time of your life. Don’t give up the opportunity to make some great memories and new friends! Even though I’ve gone to many organization fairs, I still find clubs and organizations that I think are fun and of interest to me (and there’s always some free swag you can get 🙂 )! If you’ve never been, I definitely recommend it! Hi everyone! Not a lot has been going on over here at Loyola. As students, we are currently in a state of limbo. First exams have not happened yet and so we are just going to class and doing homework and trying to get as much sleep as we can before we have to buckle down and study. So, because my weekends are free of over stressing my brain, there is plenty of time to go out with friends and try new things. Since I am a major foodie, new things for me means new restaurants and cuisine experiences. One of my favorite things to eat is sushi! I like how sushi is lighter and a bit more refreshing in opposition to such foods as burgers and pizza. This past weekend, I went to Bistro Sake located at 7600 Madison Street in Forest Park. Since I am a fifth year student, most of my friends have already graduated. And as a Bio major, I have some friends who have made their way into medical school, specifically Loyola’s Stritch School of Medicine. 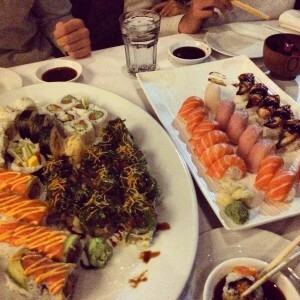 I was visiting them over in Oak Park which is close to the medical school, and we decided to get dinner at Bistro Sake. The best thing about this place is that they have an all you can eat sushi menu. You pay twenty dollars, and in exchange, you get to eat as much sushi as your stomach can hold. The only catch is though that you have to finish everything on your plate, because they charge you for any leftovers. I was a little leery of an all you can eat sushi place, because I thought that the sushi would be low quality, but I was definitely wrong! The sushi was phenomenal and very fresh! The menu for all you can eat consisted of appetizers, soups, salad, sushi rolls, and individual sushi slices. It was three pages long and all of it was all you can eat. Did I mention that it was only twenty dollars per person! Super cheap! I went with a group of three guys so of course the ordering was outrageous. They had all just finished a med school exam and had not eaten all day, so needless to say, we ordered more than once. The food was great, the staff were friendly and helpful, and we left there stuffed. Overall, it was a great way to spend a Saturday catching up with good friends over good food!